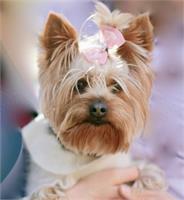 Andie B, a 5 year old Yorkshire terrier has been a part of Be Well Bodyworks since she was 9 weeks old. She is not only the BeWell mascot, she is also the office manager and security alert system. She has a very calming and mellow personality, and loves to accompany her mom during massage sessions enjoying the energy work and peacefully napping. While she is not attending therapy sessions, you will find her greeting clients and bringing smiles to everyone's faces daily in between her frequent naps. Andie enjoys chasing squirrels, playing with her toys and going on adventures when she is out of the office. Andie B is currently not instructing any classes.